In 1983, Cultured Cowboy started selling Justin Boots. We opened our account with three men's boot styles, an orange looking cognac color, a dark brown, a tannish color, and a few ladies sizes in one basic style. The salesman wanted us to put in a black one too. I remember that we just barely had the money to get all the sizes and widths in those first four styles. So we told him we could work in the black one over the next few months. Wow, what a beginning. Since then, we have ridden a roller coaster ride of rodeos, Garth Brooks, Chris LeDoux, line dances, Y2K, and this year has been our best since 1998. We saw our good friend Dennis High, come and leave as President. We have enjoyed many of the changes, and admittedly, gotten aggravated at a few. (Just like family!) Randy Watson is doing a great job, and we are proud to offer today's Justin Boots. High tech has met with tradition. New guts and new soles with leather uppers have made the Justin Boots you will see some of the best boots in the world. Lace-Rs, Traditional Cowboy Boots, The Punchy Collections, Jel Boots, Ropers, Tekno Crepe Boots, Exotic boots, George Strait Collection, and Classic Western boots for men and women combine with some of the best kids boots made. Below are links to all of them, and some links to tips on fit and care too. 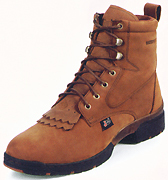 Laces on the lace up boots allow you to tighten or loosen, as your feet may actually change sizes during the day. Feet tend to be more swollen in early morning and late evening. For feet that do change a lot during your day, lacer boots are a good answer to your comfort issues. Laces also give the most ankle support. Consider this high quality footwear for your wife and children too. Especially during the growing years, the bones of your feet will form only as well as you allow. Lack of arch support, cramming a growing foot in an outgrown shoe or boot, - either can deform foot bones permanently. I know they might not wear these Justin kids boots out fast. Just pass 'em down to another youngin! Proper foot care when young will pay tremendous dividends in all their years to come. Cheap made shoes create all sorts of problems years from now. And soft bottom tennis shoes, designed for active sports, were never made to wear all day. Although the bottoms of today's Justin boots are much more comfortable than 25 years ago, they still have proper arch support, ankle support, toe room, and all the guts that make a real Justin cowboy boot. Cultured Cowboy is your dealership, offering all Justin Boots available. If you are looking for a Justin style that you can't find, just call or email. We'll be glad to get it for you at a very fair price. Please call for any more information on any Justin boot or fit. We have been in process of rebuilding the Justin part of our site with updated styles, pictures and tips. If you are looking for a Justin boot, and know what you need, and can't find it, you are welcome to call our toll free number or email for a price quote. This site is now finished except for the Casuals. God Bless, Thanks. 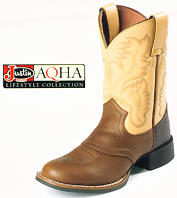 Justin Junior Boots are also at the bottom of each category page Gypsy, AQHA, Ropers, and Lace-Rs.